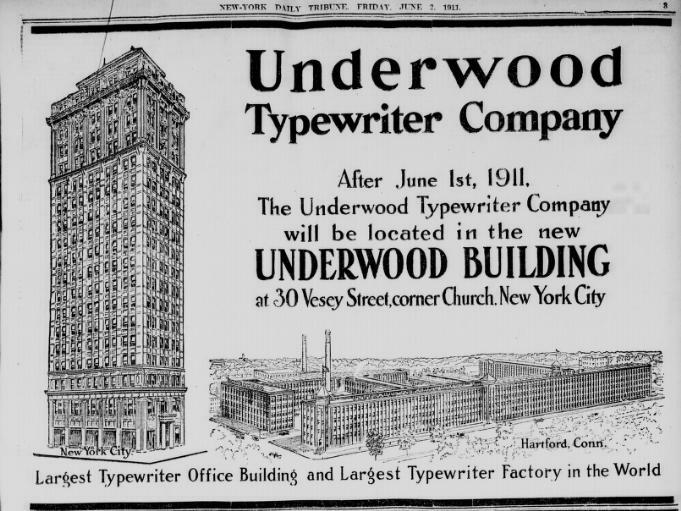 Although the famous Underwood Typewriter Company had principal manufacturing plants in Hartford, it was a New York company through and through. Its founder John Thomas Underwood became so wealthy that he built a stately home in the neighborhood of Clinton Hill, Brooklyn. Following his death in 1937, the estate was donated to the city and transformed into Underwood Park nearby Pratt Institute. 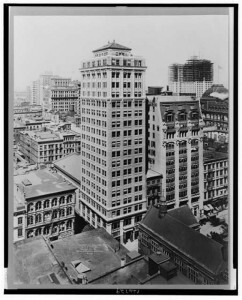 He desired a great skyscraper for his booming company, emulating those great towers built by industrialists like Frederick Bourne (of the Singer Sewing Machine Company and its companion Singer Building), and newspaper men like Joseph Pulitzer (who, after all, now used Underwood typewriters in their newsrooms at the mightt World Building on Park Row). 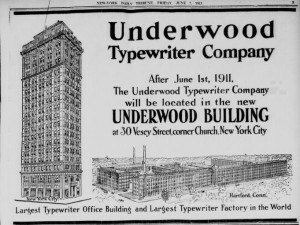 The Underwood building, at 30 Vesey Street, was designed by the firm of Starrett & Van Vleck, better known for their department stores than their skyscrapers. Their roster includes the flagship locations of Saks Fifth Avenue, Bloomingdale’s and Lord & Taylors. Looking up at all 17 floors of the Underwood Building, one can see some of its touches imitated in those more famous, accessible buildings. 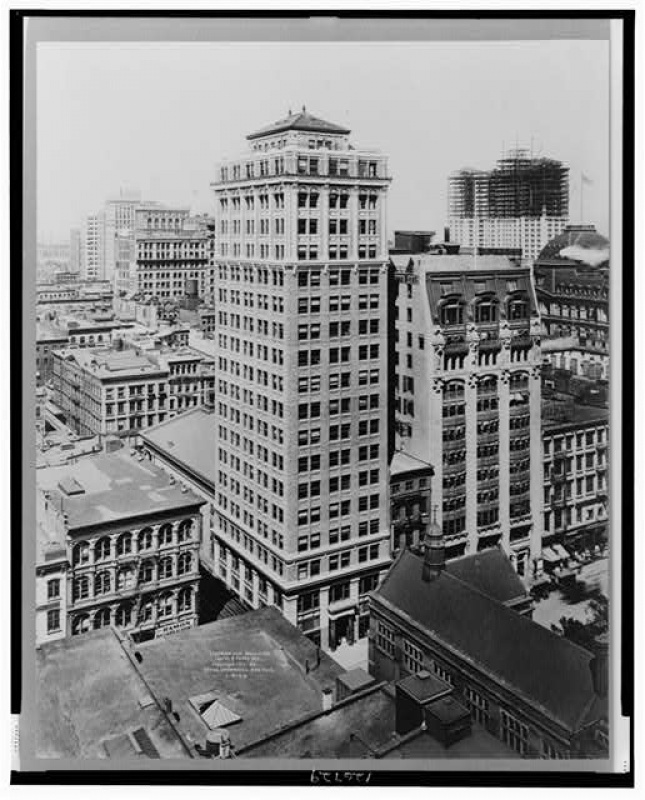 The office building was quickly overshadowed just two years later by another skyscraper rising one block away, over three times larger than the Underwood and another great monument to industry — the Woolworth Building. 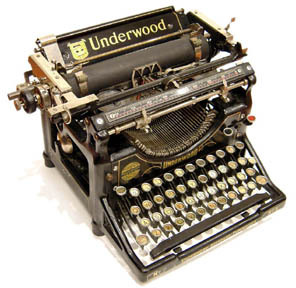 The Underwood sustained serious damage during the attack upon the World Trade Center in 2001. But it still stands today, hovering over its old neighbor, St. Paul’s Chapel, and greeting a new one, One World Trade Center, rising to its west. MYSTERY! In the picture above, we see the south and west faces of the Underwood Building, the corner of Vesey and Church streets. (In the background you can see the Manhattan Municipal Building being constructed.) Today, across the street from the Underwood on the south side, is the famous St. Paul’s Chapel cemetery. However, in the picture above, there is clearly a building sitting there, the one with the odd little turret! Any idea as to what that is?